With Salford City FC racing through the leagues, with an eye long-term on the Premiership according to their owners, The Class of 92. The club finished the 2017/18 season as champions of National League North, with home games being played at The Peninsula Stadium (also known as Moor Lane). This means that “The Ammies” will start the 2018/19 season one division below the illustrious Football League which is their major aim over the coming years. The Salford City Home Shirt comes in a bold red plain style shirt with this seasons Soccer Saturday Super 6 competition sponsor emblazoned across the chest of the players. The shirt can be purchased from the Umbro online store by clicking through on the link above. The Salford City Away Shirt is again quite a plain design with the majority of the shirt in a cream white with some black piping down the sides of the shirt. Again the club’s main sponsor is displayed across the front of the shirt. The Salford City Third Shirt comes in royal blue with white piping in a similar style to the Away Shirt. 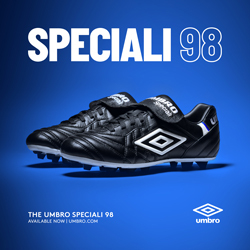 Again the shirt can be purchased directly from the Umbro online store by clicking through above.